It’s been a while since I was compelled to count the number of failed treatments in a group. But, I’ve noticed that the trend is moving toward higher and higher number of failed in-vitro and even egg donation cycles, so I decided to pull the numbers from the questionnaires people filled out for the last two intro series. 60 in the first group plus 54 in the second. 114. We’re talking about two small groups. Parent: I’d do anything for my children! Scientist: Here’s how to stave off climate change so your children can stay on earth. Mom-To-Be: I absolutely LOVE this Fertile Heart OVUM work, and I know SO MANY WOMEN who could benefit from it. Julia: That’s exciting! I’m really looking forward to meeting your friends on the calls. Mom-To-Be: Well, I didn’t tell them about it, because, you see, I’m not pregnant yet. But believe me I’ll be shouting from the rooftops when I have my baby. Julia: Bummer! You know, I was hoping that a few thousand couples having conceived with the help of this work, would make it worthy of passing on. But, sure…I understand, let’s just keep walking to meet your little one halfway….Looking forward to those rooftop shout-outs whenever you’re ready:). Could this baby girl have been born at a lesser risk to her mom’s and her own health? New Mom: Our baby is here, after all the failed treatments, I can’t believe we really made it, Julia, how can I ever thank you? Julia: I’m sooo happy for you, congratulations and thank you so much for asking how you can help. Remember those rooftops you talked about not that long ago? It would be very helpful if you occasionally shared my posts on your Facebook Page with a note to your followers, so I can reach a few more women before they go through the 10 failed IVF’s you’ve endured. New Mom: Oh…I can’t do that! None of my friends know we had trouble conceiving. But keep up the good work! I’ll probably be back on those calls when we’re ready for #2:). *Sophia Benoit is a journalist, whose writing you can enjoy on the Guardian and other sites. A very smart, funny woman, who I hope would approve of using one of her tweets gone viral as my inspiration for this blog post. Absolutely want to spread the love of this program! In addition to linking others to the program through social media/internet/word of mouth, one goal is to become a yoga teacher and an advocate/affiliate further linking others and spreading the beacon of hope that is fertile heart! It makes my heart happy to know that I can touch others who need the program as much as I do/did even before and after I have met my child. This is a beautiful way to stand outside of the personal journey to help the view become more wide and clear Julia. I love and support your mission to help others struggling to find their way to themselves and their families in a world growing more towards technology than humanity. I am so thankful I found you and want the same opportunity for others. I felt very sad to read that such a small number of women have experienced so many IVF cycles. Ouch. To the continued growth of your very important work. I promise to do my part. “There are high chances that Julia’s chat with other fertile mums can give an extraordinary insight to us”. Definitively. Because we are all in the same journey. What touches to some of the participants, can touches to us as well. A while ago this happened to me. Another fertile mum was told by Julia in a phone circle to stop working with the ‘orphans’. I realised that I should do the same. I had become an expert spotting orphans all over my day! At the end, it was not very pleasant and I think this work is also about pleasure and desire and longings for those, like me, that sometimes struggle with that side of life. To stop spotting Os was the door to the V, with the help of the UM of course. To connect with the V had been an issue for me. However, listening to that chat of Julia with one of you, it was the clue I needed. A strong V started to show up with amazing insight. That was quite a few weeks ago. Yesterday, I participated in another extraordinary fertileheart phone circle. One of you showed up crying at the bench (thank you so much for that gift you gave to me! You’ll know later why!) Your chat with Julia provided me with an incredible insight. Guilt is an emotion I need to work with. The guilt that tells me that I need to suffer and I can’t tell you how much I have been complicating my life so far! So my imaginary work yesterday night was ‘the room of guilty’. It was a WOW! I will be visiting this room AM and PM for at least a week, as Julia always says. I look forward to the UM opening the door to freedom for me twice a day. It feels so sweet. Even the V showed up there yesterday night at that room! :-) I don’t have any doubt that this will do some deep work. I look forward to it and to the next circle! Thanks Julia for your unconditional support, intelligence and Love! Just reading your post was the insight I needed! Only this morning, I was batting with my imagery. Nothing felt right. I have severe fear orphans, so much so that they impact the quality of my life on many levels. I want to do Room of Fear, but every time I try, it just feels like nothing. I mean, I only feel worked up by seeing all that scares me. I feel worse. But your sentence of “I look forward to the UM opening the door to freedom for me twice a day” turned the light on. THAT’S what I need to focus on, not the monsters in the dark room. Boom! It suddenly makes so much sense! I get to choose which part of the imagery to focus on. I was choosing the orphan way. And your other part about working WITH the orphans also made so much sense. I sometimes (actually, all the time) feel completely dictated by the orphans. I see some of my mom friends who are literally bossed around by their kids. I think “Come on. The kid is just tired. Give him a snack, let him have his fit and move on with the plan. Don’t give in to his tantrum.” And yet, that is EXACTLY what I do with my orphans. I just let them have their fits and I buy right into it, getting sucked up in their drama. When I see this happening all the time, everywhere, with my many orphans, it becomes so discouraging and frustrating. Like “I’ve done this work for years and I’m still messed up and not pregnant to boot! WTH?” But I now see that I’m using all this energy to work WITH my orphans or fight them and not parent them/work with the V. Man, I’m so glad I read your post today! Thanks! I realise I’m scared of people beyond my close network of family and friends knowing about my infertility. On close reflection my orphans of feeling a failure, being embarrassed about being unsuccessful and comparing myself to others’ ‘perfect lives’ are bigger than I thought and If this blog has brought them out then that can only be a good thing. I have only recently become active on facebook and your blog has provoked my feelings about shouting from the rooftops – can I like your page from my personal account? …I’m really struggling with it but I am promise to try and work towards that goal. In the meantime I am going to open a twitter account and connect with others to save them from unnecessary heartbreak. If I can do that and steer them towards your amazing work then with My UM as my witness I will be shouting from the rooftops much more than I am now. There is so much food for thought here! The first play is such a good reminder of how myopic our vision can be, and how easy it is to ignore the harm we, as a species, are doing to our beautiful planet. I have to admit that I often feel so overwhelmed by the changes that need to be made, that it can be easier to step away and pretend it’s not happening. But then I remind myself that taking small steps is better than doing nothing. Recently, I watched an interesting documentary called Cowspiracy, about the harm we are doing to the environment by eating animal products. I’ve never been vegan, but my diet has typically included a very high proportion of vegan food. But I’ve realised that in the last couple of years, through a combination of trying to conceive (the nutritionist I saw suggested I increase my intake of animal products), and now living with a man who loves meat and fish, my consumption levels of animal products have crept up. But since watching that film, I decided to be more mindful of when I was eating animal products and to only eat them when I really wanted them/needed them and not just because my husband was, or because of what the nutritionist had told me. I know I have some pretty big orphans around telling people about Julia’s work. While I am very happy & comfortable going on a website/fertility forum and singing its praises to strangers, telling those I know personally is a different story. It is partly because I have only told a few of my nearest and dearest that we are trying to conceive. This is not so much about being ashamed that this has been a challenge for us, and more that I don’t like people constantly asking ‘How’s it going? Are you pregnant yet?’ or stare at my belly every time they see me. With those I have told about our journey, I am incredibly open – and they all happen to be friends though who completed their families before we even started trying. But if I had a friend who was struggling to conceive, I am not sure my O would find it easy to tell them about the FH work at this moment. That sounds selfish, I know, and it’s not something I’m proud to admit, but it is where I am at right now. That O would be scared they’d start doing the work and get pregnant immediately, while I am not yet pregnant. I have this megawatt O that says says ‘How come all my friends got pregnant, and some of them even against fairly big odds, and I haven’t yet?’ I wish I had a more developed Visionary who would be comfortable sharing the work, and would trust that everyone’s journey, including my own, is unfolding in its own perfect way. I am just being really honest here, and hope that by seeing that O fully is a first step towards healing her. I liked the image of the council of babies wanting to see if we can care about the planet. I hope some comments made on some fertility forums have helped some people and I will continue to do that. I believe the Fertile Heart work is about respecting ourselves, respecting our planet, respecting our children. Some of it is learning how to love ourselves, when fertility challenges can make us not like ourselves or our bodies. If we can love ourselves through the tough times, what awesome parents are we. Our children will be delighted because we will love them through the tough times as well. I’m working on loving myself through this job search. It is helpful when the OVUM work tells us to love the orphans. I have been working with Welcome Home Fertile Heart Body Truth and Field of Creation Fertile Heart Imagery. I’ve been doing a lot with fear. Looking for a job takes me way out of my comfort zone. I liked the Celestial Gravity piece about the poem from the Aboriginal people about So that the image of Your love could be brought into existence. I’ve been meditating on what I have been receiving lately in my faith teachings that says the only way to love another is to see only the good in them. I guess that could apply to loving ourselves. I’ve been working more to see the good in others, as in my mind I tend to be critical. I have been birthing the visionary Robin who can face job searching bravely and also work with the uncertainty of my schedule that has been uncertain for about 6 months and make it as conception friendly as possible. Thank you for this witty and challenging blog, Julia! In am so happy I found and joined this wonderful Fertile Heart community of amazing and strong and beautiful women. I am grateful for all your work and I am grateful for all their comments and work. The following (your) sentence really resonated with me and I explain why below: “I understand, let’s just keep walking to meet YOUR little one halfway”. It so much resonates with me as regards my fertility journey (it reminds me to reach out of my sometimes selfish zone of what is important only for ME and MY baby) and it also resonates with my current work, where I focus also on environmental law and topic of solidarity (compassion and care) not just towards US (human beings as subjects of law with rights), but towards environment, Mother Earth (with HER rights) as well (and how we should move from anthropocentric to ecocentric approach if we are to survive on this planet we call home and to preserve it for our future generations). For me, it is both also about how to widen our circle of compassion. I do not use Facebook or Twitter for various reasons, but I spread the word (titles of your books, your websites links) about your work where I can. On various websites (forums), and in person, with women I got to meet and discuss our path to motherhood. I know I could do much more. I am going to. This 3 short plays helped me to identify some of my orphans, which were holding me back (from doing more), because Os thought it is important to wait for “the result” (“proof” as Sparxy said). It also helped me to realize that I (my Os?) planned originally this journey as a way to achieve certain result or “product” (i.e. baby). How little did I know. I hope I know a bit more by now, I definitely keep learning. I think that by refusing “here and now”, because I wanted something else (my future with my baby), I was basically denying my miraculous path, myself, my life story and I was not giving a space for whatever — I am to conceive –on the way. Thank you so much Julia, this journey is truly a gift, not a burden! It was so hard for me to like and share on Facebook. In an intimate conversation with close friends and family I talk very openly about Fertile Heart and how much it has helped me; but it’s so close to my soul that I find it hard to share more broadly on social media with colleagues and acquaintances. 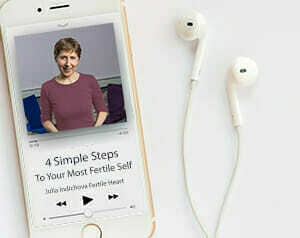 But I remember the isolation I felt when I was going through years of fertility treatment and couldn’t find any source of support that didn’t reinforce all the guilt and shame I was feeling at that time … until some years later I discovered Fertile Heart. If this helps someone who is alone in their home feeling much as I did, discover that there is support and another path, then it’s worth it. The fertile heart practice has truly changed my life and one of the best parts of my journey was when I was finally able to calm my fearful orphan, challenge my insecurities and anxieties and posted a detailed heart felt note on Facebook this past December. It helped me to heal on so many levels. I felt empowered, strong and passionate about helping others to hopefully find you faster than I did. When my doubtful orphan is in control I re read what I wrote and my own words soothe my soul. I could not have written that post or shared those emotions and part of me without my fertile heart practice. I know that the more I share and the more I spread the word the more men and women will find you and maybe just maybe in that one small way the world will become a better place. After all, in what world is that baby surrounded by needles an ok thing? A miracle? For sure. 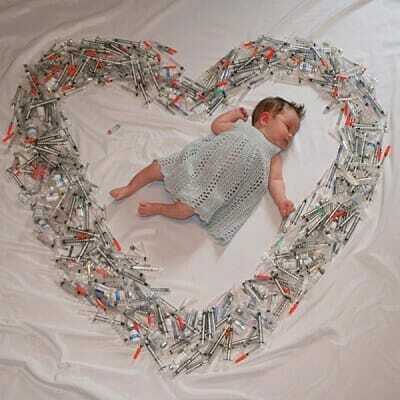 But so is every other baby without a heart made of thousands of needles. All my love to you Julia. Maybe rooftops just aren’t high enough? :) We can all do better for you. So very very true and thank you. Yesterday, we had a special complementary chat with Julia about ‘anger’. As usual, for me it was very inspirational and insightful. I asked her about few imaginary work I could use to ‘release anger’ and Julia wisely told me that I didn’t have to ‘release’ it but use if as a friend to fire my longing. She recommended me “Room of anger (instead of fear)”, “cry for justice”, “jail breaker” with the jailer being ourselves and also some body works like ‘Wailing walls’. I’m posting today about my experience yesterday night and today morning with ‘room of anger’. I’ve done the ‘room of fear’ imaginary work many many many times, in different periods along the last years I’ve been doing this work. I never got it really. But yesterday with ‘room of anger’ it was beautiful, just incredible. I entered to the room with my UM and the learning I could absorb there was incredible. It came very vivid that anger was a lovely friend and I wanted to live with it with love (the love of the UM next to me). Anger was not there to threat me but to help me. The feeling of relaxation and inner calmness with that new friend was beautiful. But also strength and longing and motivation to move on came up as well! As usual, I will now work for at least a week, AM and PM, with this one to see what else can come. I know that I have now integrated ‘room of anger’ to my personal OVUM library (I say that when I can understand/live fully a imaginary work). So looking forward to deepen on it! Once more, thanks Julia! Beautiful, raw, and real post. Thank you for modeling what it looks like to speak your truth and have your voice heard. I was recently in a group of people and two separate couples were talking negatively about the soul sucking experience of IVF treatments and why they just had to keep “trying harder.” I could not help but enter the conversation noting there were resources to “try smarter” instead of “trying harder”— and to reference you, the books, the community, the tools. I noted if they were open to exploring their truth, at a minimum their lives would transform in exciting new ways. That is a pretty good return on any investment! I ended up writing book names/web site info on a papertowel (ha! grassroots) and giving the hand written references to both couples. I love connecting with people like this—in real life-in the moment—and sharing information about fertile heart. Thank you for sharing your calling. Hi Julia, thank you so much for sharing this post!! Being very new to the Fertile Heart work, I recognize my own orphans in these anecdotes. I’ve already caught myself saying exactly what you write above… when I have my baby, I will share this work. I see that there is a lot of healing I need to do around my struggle to get and stay pregnant and my yearning for approval. This has always been a big fear for me and I am thankful for the challenges that are allowing my orphans to show up to be heard and healed. I am committed to sharing this work because just in these few weeks I have noticed a profound change in myself and my approach to pregnancy and motherhood. I see this work preparing to birth a new me and it is scary but utterly exciting. Thank you, thank you, thank you from the bottom of my healing heart. Love that username! Your comment makes me think about the difference between longing for approval and a wish to be acknowledged/respected/seen/heard. Hi Julia! I have done everything I can to share your work, although I know I could do more. Sometimes I want to get pregnant so I can say, Julia helped me so much, here is proof. But the thing is, your work has helped me so much even though I don’t yet have a baby. I know that, but so many people just don’t get it. I think many people seeking advice and nourishment just see that one end result as success, when Fertile Heart is so much more. So, I take these mini-plays to heart and continue to work toward being fertile and making the world a fertile place, rather than just having a baby (although that would be a great side effect :)). So nice to hear from you, S.! would love you to become a Mom, if that’s what you discover you really want. But take the pressure of “proof” off your beautiful shoulders, because the people looking for proof will never be convinced of anything. Besides, if proof is what they want, they can look at the stories on the site. You know, it’s funny but it never occurred to me that I would need to prove anything to anyone. What I teach is so self-evident that the idea of having to prove it is amusing. And…you’re absolutely right, most people only value the result, they have their journeys, you and I,we have ours. And…you’re absolutely right, most people only value the result. They have their journeys, you and I, we have ours. Thank you dear Julia. I have begun shouting from the roof tops while I walk towards my baby. My partner isn’t too happy about it. Well, we all got some growing up to do. We have a serious and global problem here. Is all I would say to everyone who isn’t yet shouting from the rooftops. Those statistics are too depressing. I have recently become active on Twitter. I have exactly 3 followers so far but have about 200x more friends on Facebook. In any case the number of people I saw on Twitter who are openly in favor of and promoting ART is shocking to say the least. There’s so much work to be done to even be aware of the magnitude of this problem that the thought makes me cringe. I amready to shout standing on the rooftops Julia! I committed to myself to promote Fertileheart work, fertile female book & about you in every forum I can so that the good work canreach out to ppl in need. But once i crossed my fear orphan, it felt so good to like, share, comment. Especially last actions made me feel empowered. Now i feel proud to say i conceived my child after ttc for 8 long yrs. I feel no shame but instead filled with pride on how i perceive the fertility journey. Had I not embarked on FH route, I sure would have been unhappy, disappointed, frustrated, shameful of my age, my journey, & maybe even my baby. Once again thank you from bottom of my heart. Please let me know – How may I help you? I think I’m ready to shout from the rooftops about you, miraculous MiraculousLife! You always manage to make my day, teaching me what a powerful healing agent it can be, to be heard by just one person! Thank you! You caan always count on me. I can never forget how thid practice and more than that how your persistent guidance – be it answering my countless wuestions, hearing all my dreams, offering me private sessions, before enrolling into private sessions how you have followed up for 5-10min each day almost for a week – 10days, how you were always ahead of the curve my (of course that is my you were my guru & go to person) by almost months before i realized the same exact orphans by myself & most importantlyyou had such a strong belief in me & my baby dream more than i ever had on my own dream & guided meto the right way to realize what i really wanted. If not for this work I would have never went thedonor tissue route and would have never received my miracle baby. I just feel so grateful whenever i see my baby. Am i so glad i made the right move from a visionary state and in spite of the journey being a rolla coaster ride, i havr flipped the experience into a memorable moments of my life. The ivf journey was at its best. Having gone through failed cycles, i can feel and sense how Fertileheartwork changed my life forever. No matter how many times i say, i know it just doesnt deel sufficient.